Pruning is an important part of maintaining the trees and hedges on your property. If you do not properly prune trees and shrub growth, the overall health of the tree and hedge will suffer and your property will not look as appealing. When we prune trees, we remove deadwood and any branches that might be at risk for falling. If we see signs of disease, we selectively remove areas around the diseased parts and advise you on ways to cut down on that risk. We also prune and shape your hedges and shrubs. While some hedges and shrubs can be relatively simple to prune, tree pruning can be quite complicated and should only be handled by a qualified professional. Sometimes if you try to handle these types of cuts yourself, you could potentially harm the tree and make a cut that will not properly seal over. Too, some of the pruning that needs to be done on the tree can be located quite a distance from the ground. Do not risk getting hurt! 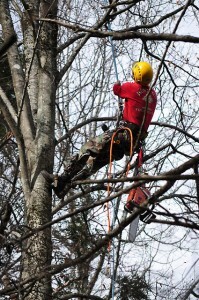 We can handle your tree pruning needs. We Handle More than just Pruning! Let Hunter’s Tree Service, Inc. help you with all of your tree service needs. Besides pruning, we can help you with view enhancement on your property, tree removal, stump grinding, bucket truck service, crane service, lightning protection, tree cabling, pre-construction consultation, and fertilization and pest control. Our friendly staff and team of arborists are led by Tony Hunter. Tony has worked extensively in the High Country. Both he and his wife, Judy, are certified by the International Society of Arboriculture to be certified arborists. If you are looking for a professional company to handle all of your tree service needs in the High Country, Hunter’s Tree Service, Inc. is ready to help you. We understand the importance of customer satisfaction, and we put a high priority on safety. Contact us today!